Riad for rent in exclusivity! you enjoy total independence and privacy. Ideally located in the Riad Zitoun el Kedim area, just a stone's throw from the famous Jemaa el Fna square. Decoration combining modern and traditional. It consists on the ground floor of a living room with cement tiles on the ground and tadelakt on the wall, bioethanol fireplace, reversible air-conditioning, lcd screen & home cinema, satellite tv (tnt france), wifi access, a bathroom and a charming typical patio with a ficus wood fountain. Upstairs there are 2 bedrooms, each with bathroom and toilet. (only one is air-conditioned and the other has a fan). Finally the terrace with covered lounge and deckchairs to enjoy a sun bath before going to lose you in the shady alleys of the medina. Seen on the Koutoubia and the Atlas. shower room on the ground floor (washbasin, wc) and each room has a shower, sink and toilet. 2nd Time Staying at the Property. Better than before. This is my second time renting Oliver’s place in Marrakech and it is excellent. You will not find a better private house centrally located in the square with a parking spot! The area is safe at night also. Since my last stay the bathrooms have been upgraded and it was the nicest shower I had in Morocco. I will be renting this property when I return to Marrakech. Oliver is also super responsive and on time to the minute. We really enjoyed our stay here. Olivier was easy to contact throughout the stay and helpfully able to arrange transport to and from the airport. The main square and all the other main sights are within easy walking distance. The beds were very comfortable and the riad was well equipped. The roof terrace is accessed via extremely steep stairs which took a bit of getting used to, but was fantastic once you were up there. 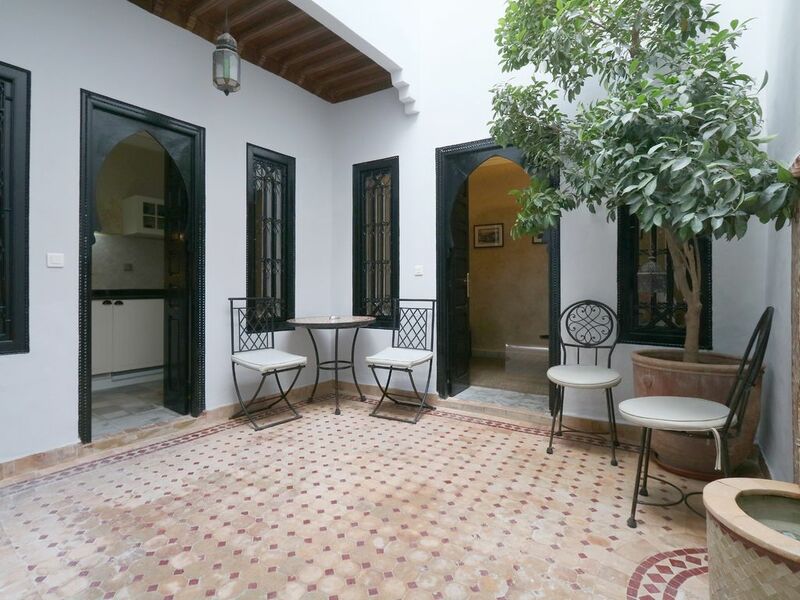 A really clean and functional riad, very close to the heart of the old city. The riad is extremely functional and the roof terrace is a delightful retreat. It is far enough away from the square and souks to be really quiet both at night and during the day. Very restful. The ensuite bedrooms very clean and comfortable, the lounge area also comfortable. A pleasant, yet fairly small courtyard, very cool during the heat of the day. Olivier the manager very helpful with directions to the riad and also totally unobtrusive. The only slight criticism would be the place lacks a little Moroccan character and decoration. It felt slightly more like a function holiday home than a Moroccan riad. This did not deter from the stay whatsoeever as there is enough life and energy in Marrakech. Nous sommes très contents de notre séjour dans ce beau Riad. Cependant, petit bémol pour l'éclairage en général trop faiblard à notre goût dans les salles de bains, de la cuisine et du salon et très déçu de ne pas avoir pu profiter plus de la terrasse sur le toit dû à la lumière sous le patio qui ne fonctionnait pas malgré notre requête à ce sujet auprès d'Olivier. Jolie Riad très bien situé. Nous avons passé un très agréable séjour en famille dans ce très jolie Riad. La terrasse est agréable et nous en avons bien profité ( le beau temps était présent tout le long du séjour). Le très bon emplacement nous a permis de faire le tour de tous les coins de la médina à pied. Nous sommes ravis de ce séjour. To get a better idea of ​​the exceptional location, locate the ad. Conformément à la loi Marocaine les couples marocains doivent être mariés.